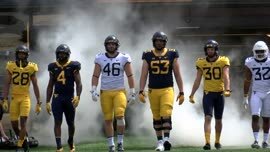 MORGANTOWN, W.Va. — Mario Alford, regarded as the fastest player on the West Virginia football team, certainly delivered the fastest turnaround last season. Through eight games at slot receiver, he owned all of nine catches and seemed entirely out of sorts. During the final four games in which he shifted outside, he caught 18 passes for an average of 25 yards. That late-season surge rejuvenated Alford, along with the coaches’ belief in him. Now they hope for an extended run of explosive plays in 2014. Alford is a senior, just like West Virginia’s opposite outside receiver, Kevin White. 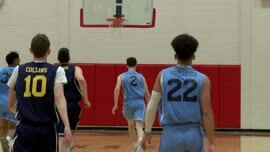 Both arrived last year from junior college with talent gushing but confidence lacking. Now they’re cast as alpha dogs for their unit, roles heavy with responsibility. That means running crisper routes, recognizing holes in soft zones and winning more catches against tight coverage. Shelton Gibson, coming off a redshirt season in which he was deemed a partial qualifier by the NCAA, is trying to crack the rotation at outside receiver. 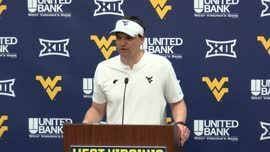 The former four-star recruit is showing flashes why he was among West Virginia’s top signees in the 2013 recruiting class. Redshirt freshman Shelton Gibson, a former four-star recruit, is working behind Kevin White and Mario Alford at outside receiver. Sure hope these receivers have someone capable of getting them the ball. Not sold on any of WV's QBs. Truth, I too question the flexibility of DH's schemes at times, and his ability to adapt the Mummy/Leach system to the personnel. But I think the Alford situation is an example of having that flexibility. As an inside receiver, I felt his speed was not being utilized as well as it could have been, and DH recognized that by lining him up outside in order to free him up, create space, and put him in more 1:1 coverages. Smaller speed guys like Austin and Shorts and Thompson have their place in this offense, but as a fan of smashmouth football, I too would like to see more utilization of size, and would use guys like DSmith and Smallwood and Cody Clay for a slobberknocking power game, and let the speed guys just run past guys. SasQ. Devine was one of the best at using his flat-out speed to gobble yards that I ever saw, too. Instead of stopping and shifting weight from foot to foot to avoid a tackle, he usually just ran full speed ahead and swerved rather than cut. Of course he could also cut with the best of them, as evidenced by some eye-popping escapes from the jaws of doom. Lonnie is one of my favorite Assistant Coaches. He's always upbeat and think he adds so much to the receiver corps. I'm feeling pretty good about our receivers. Now, if we can just get the ball to them. P.S. - Lonnie, while I have a beard, your bead doesn't enhance your looks. Hey the TruthTeller is going to post some constructive points. Rich Rod is successful because he knows how to put athletes in positions that take advantage of what they do best. I don't see that with this coaching staff. 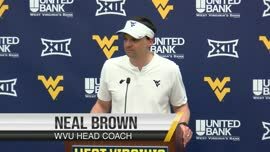 If anything, that is the reason WVU has had two consecutive losing seasons. They just refuse to learn from their mistakes. It is such a waste of talent. They have big receivers and tight ends and never use them when they are on the goal line as just one example. They remind of the coaches that told Emit Smith he was too small to play. They seem to be terrible at seeing the athletes true potential and designing plays that exploit that talent. Maybe they change that this season. I hope so. It would be nice to get to a bowl this year. LET's GO MOUNTAINEERS!!! Oh yeah you tell the truth as you see it....rich rod did not adapt to his players hell he never adapted to anything... If he would have maybe we score more than 7 vs Spitt!! I think it was Alford who ran the opening kickoff back for a touchdown in the Spring game. To be critical the effort on the kick-off team looked poor. Hope they get a lot better or we will be down 6 to 0 in the first 10 sec. vs. Alabama. Who Coaches the kick-off team? Yes, being a former Coach I try to let little get by me. It's all about competing. I'm sure our receivers and running back coaches are fine coaches, but I have a humble suggestion. I saw a lot of runs by our receivers and runners whose primary asset is speed, trying to juke and jive, then get tackled in the open field anyway. I feel like if they just ran forward as fast as they could, they could flat run by a lot of these defenses. Exactly and who was one of the best at that: Noel Devine - one of the best natural running backs the Ole Sasquatch has ever seen. He ran like a well - oiled, efficient machine. "Them" last four games were a disappointment. no, not an english major, but you would think the editor of this story could have corrected the word. why cause the young man any embarrassment ? did the editor do it on purpose? i think he did! 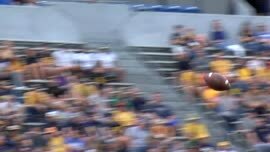 Alford, White, and Shorts should make a dangerous receiving corp. I think a lot of people have forgotten about Gibson I was disappointed when he didn't see the field last season after hearing Dana give him props for making plays in practice. He has the talent to be one of our best wide outs. You can certainly see that our recruiting has been turned up a notch since Dana arrived as we are loaded at many positions. Them teams on our schedule better watch out.